Ever walk behind a waterfall? That&apos;s what we set out to do just east of Cottage Grove, Oregon. 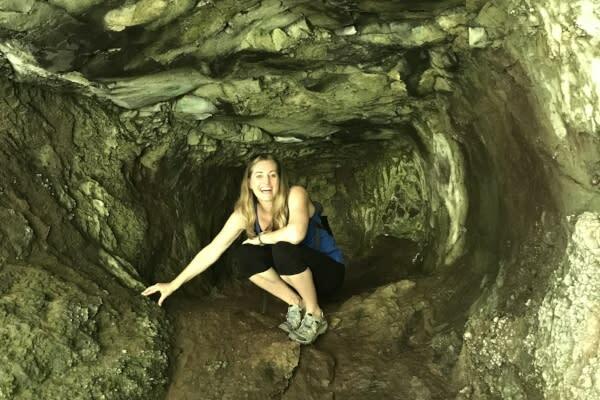 In my adventurous past I&apos;ve rappelled down the face a waterfall, jumped off waterfalls and swam in the pools beneath waterfalls under their "shower" - but I&apos;ve never hiked BEHIND a waterfall. For one thing, I&apos;ve never encountered a waterfall with this option - waterfalls as I&apos;ve known them just pour flat against the rock face and any hallowed out cervices are typically inaccessible. 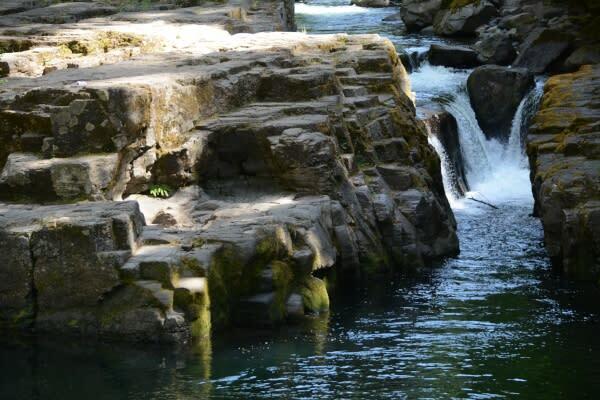 But at Trestle Creek Falls there is a ledge of rock behind the streaming water - and that&apos;s where the hiking trail goes. So I&apos;m super excited to experience this. 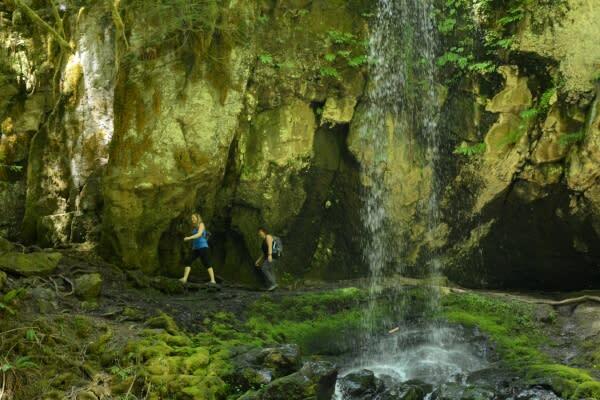 Plus our hike will include a total of three waterfalls, all in the same vicinity. It was a gorgeous summer day, just the way Oregon does them best, with a crisp sunny morning mellowing into a gently warm afternoon. The trail was along the creek so it was cool and shady. Mosquitoes swarmed, so I busted out the good old lavender spray and debated effectiveness with those applying DEET. Frequent reapplications at least made me feel like I was protecting my limbs - and the lavender was refreshing. 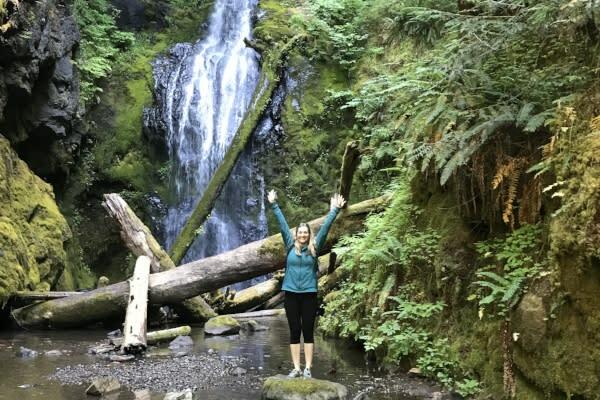 We had met at the East Brice - Champion Creek Trailhead in the Umpqua National Forest so we started with the easier hike to Lower Trestle Creek Falls. At the trailhead (which has a vault toilet and gravel parking for about eight cars on the side of the road) we crossed a bridge and then walked north along the Brice Creek Trail until the lower falls trail junction which took us up the hill. It was an enjoyable hike through fern-filled forest spiked with white daisies and fluttering orange butterflies. To my right burbled Trestle Creek, far below us. It didn&apos;t take us long to reach the lower falls. 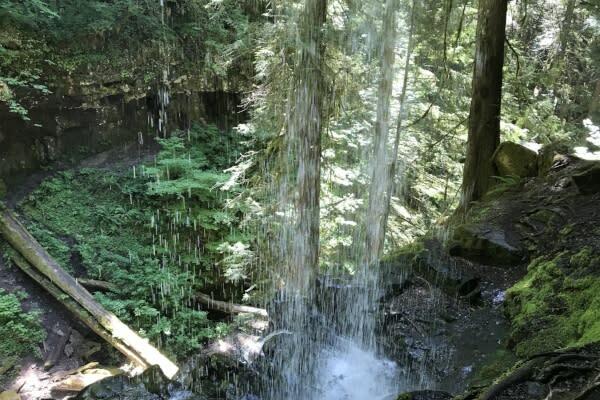 A log jam of tree trunks and branches filled the grotto basin which added to the drama of the waterfall. It was certainly a pretty place. We moseyed about checking out cool slugs and taking pictures. Here is where the adventure began. We backtracked down from the lower falls to Brice Creek Trail again and headed north. And walked. And walked. Last winter&apos;s ice storms had brought down a lot of timber and trees across the trail. The debris required occasional climbing and picking our way across obstacles. And perhaps because of the direction we were walking, the lack of an official sign and our idle chitchat, we missed the sharp right hand trail junction up to Upper Trestle Falls. 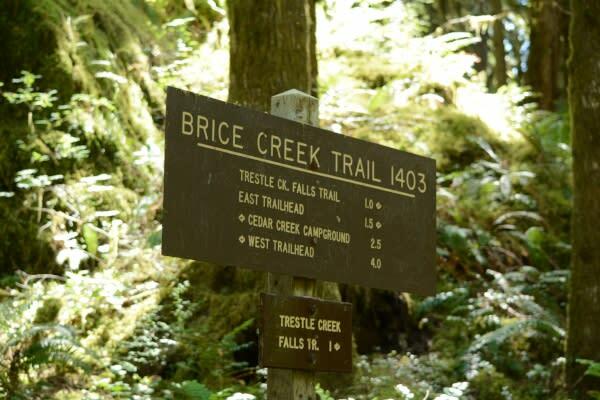 By the time we surmised that we&apos;d hiked right past the turn, we&apos;d already been seduced a fair way down Brice Creek Trail. Considering the magical beauty of the trail, we can hardly be blamed. But that meant we&apos;d just added more miles onto our journey then we&apos;d planned. We backtracked again until we came to the trail fork which some kind soul had identified with a small handwritten sign. So up we went. Hot, hungry, tired and thirsty we conquered the steep one-mile journey to the top. 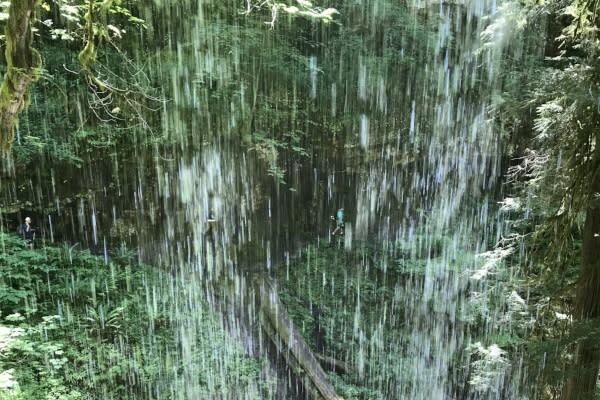 The unique waterfall experience of Upper Trestle Creek Falls was worth every mild discomfort we bore. It was amazing! The trail literally takes you around and behind the waterfall itself. It was a narrow track right up against the rocks on a carved out shelf. I actually banged my head a few times on the overhang above me. Behind me was mossy rock and in front of me was a curtain of water. I looked through the waterfall, across the canyon to where the trail continued on the far side. Drops of water splashed on my head. At my feet it was muddy (I can imagine in the wetter seasons that this trail could be much more muddy and slippery) and below me the water fell further down the hillside, tumbling into a small pool. But I felt secure and wasn&apos;t worried about slipping. It didn&apos;t feel too close to the edge. And not wanting to give up this truly remarkable experience, I walked back and forth behind the waterfall. Eventually our group made our descent down and around to the opposite side where we could then look back and admire the waterfall from the front. It was beautiful. We could see others hiking behind it which was also cool. Little cave indents were hallowed out the cliff sides and we found rocky seats and took a rest. The rest of the trail was comfortable, with only a few downed trees, and of course the downhill aspect was appreciated. We soon reached our cars, chowed down our lunches and felt refreshed and re-energized. We had one more waterfall to explore - Brice Creek Falls - but instead of hiking to it via Brice Creek Trail, we drove to the next trailhead. 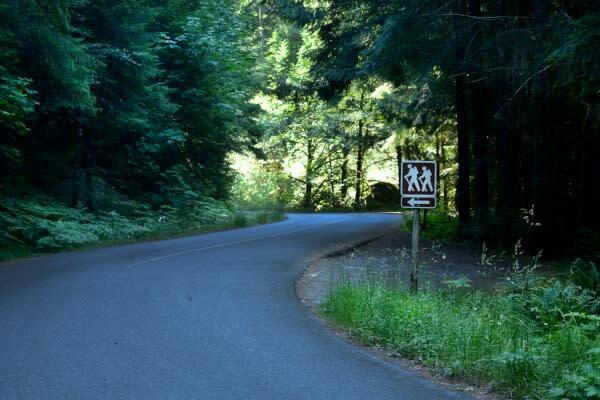 We parked at Cedar Creek Campground, the trailhead for Brice Creek Falls. This larger gravel lot also features a vault toilet and picnic tables. There was a long wooden footbridge connecting us to Brice Creek Trail and we turned south on the trail. 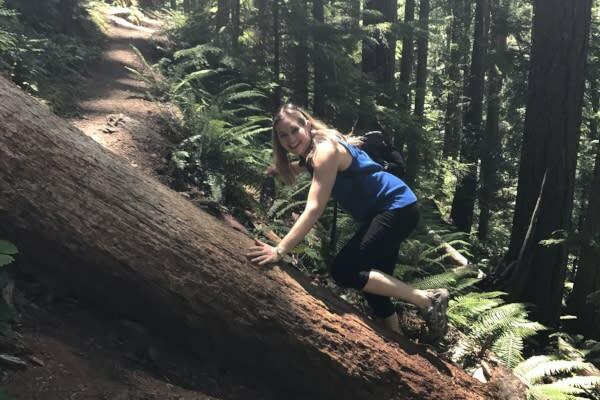 I&apos;d hiked this portion before with my young child, so I knew it was an easy, family-friendly trail. The falls here are small but nevertheless picturesque as they tumble into a beautiful pool over gently rounded boulders. 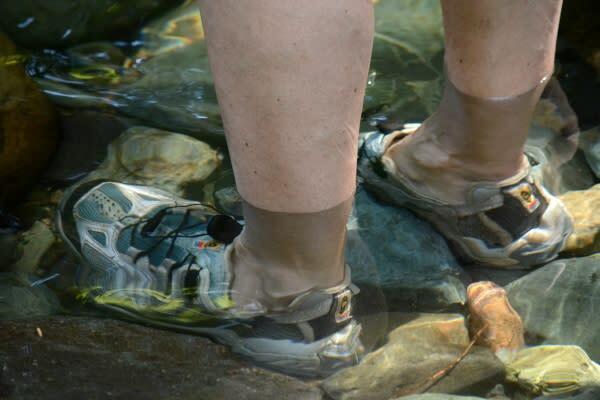 The clear water sang out to me, and unable to resist, I went from soaking my tired hot feet in the shallows to a full dip in the calm, peaceful creek. It was an invigorating finish to our waterfall adventure.